The DNR wildlife biologist who tracks pheasant numbers says the late harvest is likely to hurt the success of some hunters as the season gets underway Saturday. Todd Bogenschutz says standing crops give the birds places to hide. “If you’ve got a CRP field and it’s got standing crops around it, you know it’s still worth hunting. I think when the birds flush they are going to go into the crops and it’s going to be king of done. Where the crops are out they are going to stay maybe more where you can hunt them,” he says. “I think just for success the areas where the crops have been harvest are going to be a little bit better — but I think you can get birds in both areas.” Boggenschutz says it really depends on where you are in the state. He says some areas have as much as 70% of the crops out, where others only have 10%. He says you might want to do a little scouting before the hunt. The D-N-R survey recorded the second highest population count ever — and that had Bogenschutz thinking hunters were going to do well. 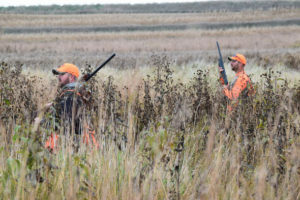 “Some places were up almost 100 percent and northwest Iowa we had a little more winter last year and some rain and the numbers were pretty much status quo — but I mean they were some of our best bird numbers in the state last year — so they’re still fairly decent even though they didn’t go up at all,” according to Boggenschutz. This darker the area on this DNR map, the higher the density of pheasants. He says he though the opener was going to be a “pretty dang good one,” but now he is tempering that a little bit with the harvest behind schedule. 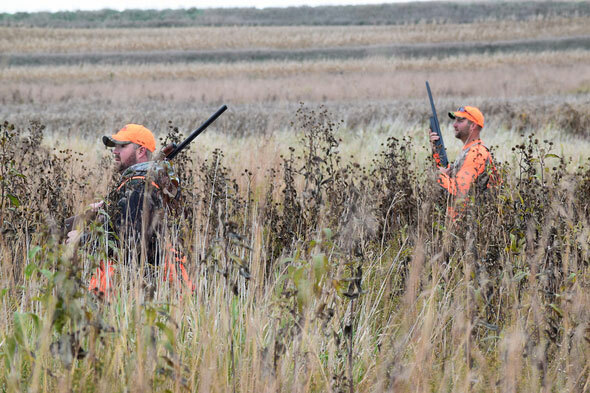 Boggenschutz says it appears right now that those who put on the blaze orange and head out to hunt are going to see some good weather. Boggenschutz says they are worried on some openers, especially when it’s warm, as that can take a toll on dogs. But he doesn’t think that is going to be a big issue for this opening day. Boggenschutz has this prediction for the final tally. “I think we are going to have somewhere in the neighborhood of 50 to 60,000 hunters and the harvest is probably going to be about 250 to 300,000 birds,” Boggenschutz says. Poor weather brought bird numbers down and that also led to a decline in hunters. He says there is potential to have much bigger bird numbers. An estimated 55,000 hunters harvested 22,000 roosters last year. That was 2,000 fewer hunters than in 2016. Boggenschutz says hunters will hopefully have success this year and the word will get out and bring more people back. The pheasant season opens Saturday ( Oct. 27) and runs through January 10th. Shooting hours are 8 a.m. to 4:30 p.m. The daily bag limit is three rooster pheasants with a possession limit of 12. Hunters must have a valid hunting license and habitat fee.